Summary: The jagoff team ventured to Bridgeville for the ground breaking of Junior Achievement’s BizTown, the town bursting with economic, mathematical and governmental hands-on learning, The duo caught up with the President and CEO Of Junior Achievement, Dennis Gilfoyle, first female President thanks to Vector Security, Councilman Corey O’Connor and showing the humorous biz at the town, comedian Joey Welsh. Since it was an album release weekend, we have Chase and the Barons “Ask Me” as our melodic tune between guests. Don’t see the player bar, above, in your email? Click the on below to listen while you dig the nice weather! 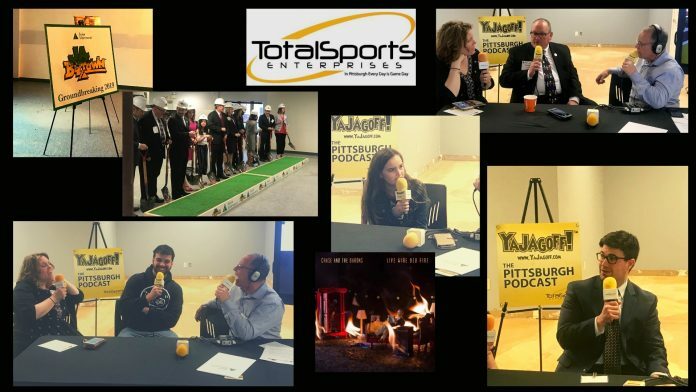 SPONSOR: Total Sports Enterprises has had a week at its new location off of Campbell’s Run Road. While spring cleaning, we found gems in colors of black and gold and those Steeler, Penguin and Pirate items can be at your next auction. TSE has auction options for any fundraiser, big or small. Visit our new location at 100 Business Center Drive or always go to TSEShop.com. Question of the day: What was your first business or first job? 2:44 Dennis Gilfoyle, JA Western PA, CEO: who is bursting with pride for visitors to walk through the doors of BizTownPGH. He has aligned his non-profit with Clearview Savings Credit Union and Bank, Mascaro, Vector Security and more to show how a town is affected by the teachings of Junior Achievement. He shares stories from visits elsewhere while developing the Pittsburgh edition and admits that the appeal is an inspiration based on multiple other BizTowns. But what’s this about night crawlers? 18:50 Corey O’Connor (Pittsburgh City Council) Not only does Councilman O’Connor reflect on his days as a Junior Achievement instructor while studying at Duquesne University, he fills us in on the student perks through Pittsburgh Public Schools and City Council. They get to ask for changes in the city as well! He appreciates JA and stands in awe of the students responsible for running the town. 31:49 Jenna, First President of Vector Security, JA Biztown PGH: This little lady is a basketball player who loves math and cannot wait to get her hands on working for her fellow citizens of BizTown. She accepts the challenge as the first lady of BizTown and admits her organizational and mathematical skills will get her through. After a few J name shout outs, delivered with perfect poise, it is no doubt that politics could be calling her name. 36:30 Comedian Joey Welsh: With a spin on all things business, we welcomed the comedian to lighten the business day with his quirky stories about being married and a fireman. He gives a glimpse of open mics in the Pittsburgh area with a focus on real life happenings and their humor. He will be with Ray Zawodni and Collin Chamberlin THIS Thursday at the Improv. Thanks To: Emily Lantzy for social, video and photos. Really? A Triple Play of Peter Parkers????? ?